Futures contracts, or simply futures, are derivative securities. That is, the value of the contract depends on the value of some underlying asset such as a commodity, stock or currency. Futures are often used by a trader to hedge or protect her position in the underlying asset. Futures are simple to calculate once you understand how a futures contract works. A futures contract has two parties: a buyer and a seller. The seller agrees to deliver a standardized quantity of something for a guaranteed price on a stated delivery date. The buyer is obligated to take delivery and make payment on the delivery date. For example, a coffee futures contract is for 37,500 pounds of the commodity. Live cattle contracts are for 40,000 pounds. In practice, futures contracts are normally settled for a cash amount equal to the difference between the price on the date the contract was made and the price on the date it is settled. No actual delivery takes place. 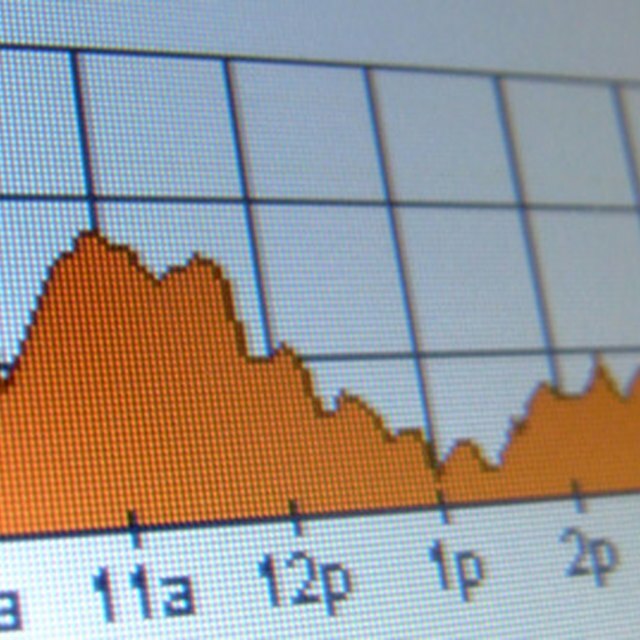 Before you can calculate futures, you have to know how to interpret futures price quotes. A quote table includes several futures contracts listed by date. For instance, you may see a table for live cattle futures traded on the Chicago Mercantile Exchange starting with May 2014, followed by quotes for contracts with delivery dates of June 2014 and beyond. Dates and the trading exchange are typically listed on the left-hand side of the table, followed by quotes for the opening, closing, high and low prices for the trading session. Prices are listed in cents per unit. For example, a quote for coffee futures of 190.5 means the price is $1.905 per pound. To calculate the value of a futures contract, multiply the price by the size or number of units in one contract. Divide by 100 to convert to dollars and cents. Suppose the price of May 2014 coffee futures is 190.5 cents. One coffee futures contract is equal to 37,500 pounds, so multiply 37,500 times 190.5 and divide by 100. The value of the coffee futures contract comes to $71,437.50. If you are the seller of a futures contract, the buyer must pay you the stated price to settle the transaction. If the price drops before the delivery date, you can buy the coffee for less than the buyer must pay. Suppose the coffee futures contract discussed above drops to 180 cents per pound. The value of the contract falls to $67,500. If you sold the contract at 190.5 for $71,437.50, your profit is the difference of $3,937.50. Of course, if the price goes up, you will lose money because you still have to sell at the agreed-upon price, but you’ll pay a higher market price for the coffee. The loss is figured in the same way: It’s the difference between the contract price and the market price on the date you settle the contract. When you are the buyer, the calculations are the same, except that you make money when the price goes up because you only pay the seller the lower contract price and you can sell at the higher market price. You lose money as a buyer when the price goes down.